Here are a few shots from the process of building the new aluminum arch to hold Distant Shores II solar panels. I have done the design (see blog here) and took it to FKG in St Martin. 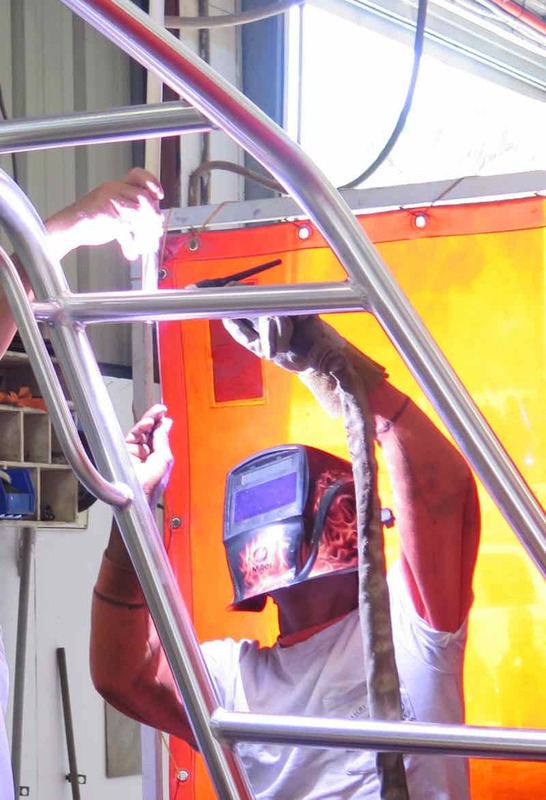 I think these guys are the best in the Caribbean for rigging and fabrication of stainless/aluminum projects for boats. Nice work on the corner support! This will stiffen the structure reinforcing the corners. Beautiful welding! We have a Rogue Wave wifi antenna and need a place to put it on the frame. Here David adds a tab to be the base mount. Sun sets over the arch - tomorrow I will hopefully be finishing up the wiring and get it running! 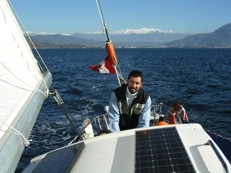 Are you dreaming of sunny sailing where you would benefit from a solar panel installation? 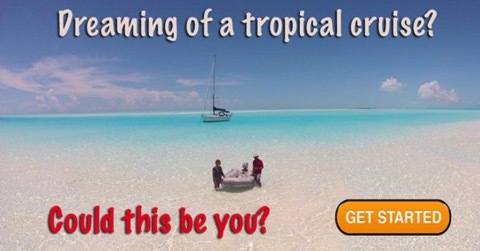 Check out our videos on all sorts of great sunny destinations! Ever since we sailed down from Northern Europe to the sunny south of France and across to the Caribbean I have been hoping to be able to soak up some of this beautiful sun with solar panels. In our northern cruising with Distant Shores II I do not think they would have added that much, but here in the south is the place!! But I do not want to just start dangling solar panels on the boat without thinking it all through. We are proud of the sleek look of Distant Shores II and want to keep that as much as we can. First I tried to plan an installation with flexible panels that were attached down on deck. Appealing since the lines of the boat would not change. I have seen another Southerly that has this and it was very tidy. There were 2 problems. With the available deck space, the amount of solar power added would not be nearly enough to satisfy our needs! It would be great to have a little to top up power when hauled out in the boatyard but it wouldn’t make much difference to our power budget afloat. Secondly the position on deck would mean the panels were often shaded by mast, rigging etc, so power produced would be even less. Unless you have a catamaran with large open deck spaces, solar panels mounted on deck will produce much less than you might hope for. So I went to work planning an arch that I thought would complement the sleek looks of the Southerly 49. I am planning it in aluminum for lightest weight. Here is my first draft at a solar arch on the stern. Drawn to scale the sailor is 6’2 to walk under it. What power do we need? 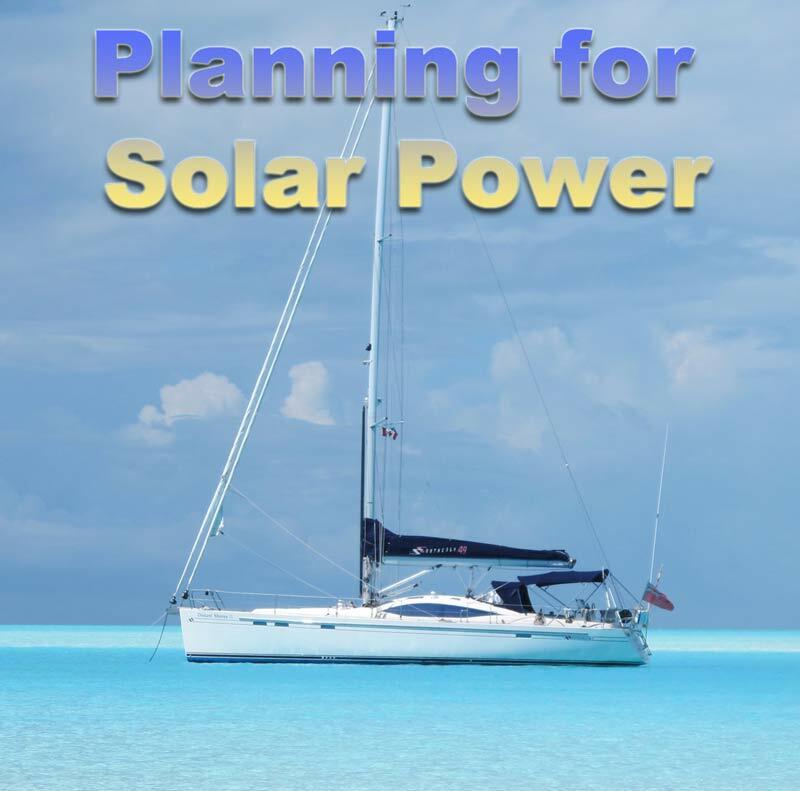 If you are going to plan solar power for your boat, knowing what you use is a definite starting point! 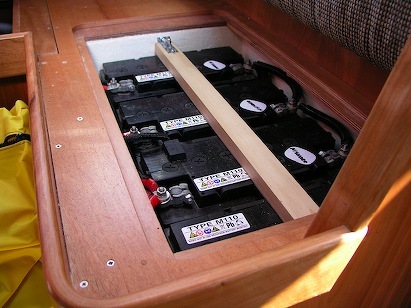 No denying that aboard Distant Shores II we are a power hungry boat! We have all super efficient LED lighting, excellent Frigoboat fridge freezers, efficient Caframo fans and more modern efficient equipment. Our 2 MacBook Pro computers are often on as we are aboard rough-editing the next episodes of Distant Shores Sailing Adventure TV show. It all adds up. Now that we are in the tropics both our fridge/freezer and our top loading freezer are using more power here in the warm climes. Our budget for power has crept up to nearly 300ah/day at anchor - about the same as we use at sea! 300ah X 12V = 3600 watts. This plan will allow me to install 3 panels each producing 155 watts for a total of 465 watts. West Marine estimates a solar panel might produce 5 times its rated in a day in the USA (hopefully we’ll get more in the topics?). To get our daily production estimate we can multiply 465 by 5 hours of full sun as a simplified formula = 2325. So we might be getting 65% of our daily use. 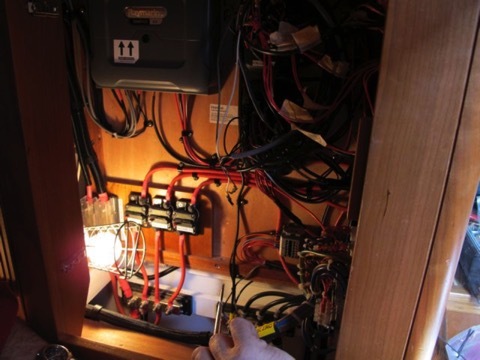 Do you know how much electrical power you use on your boat? 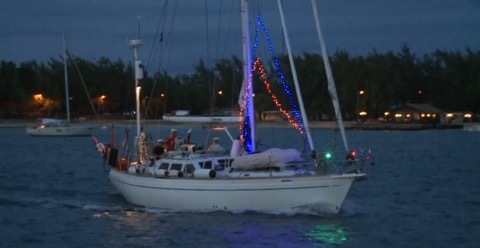 So many boats down here in the Caribbean have been hanging up Christmas lights, occasionally up the mast but more often in nice arrangements around the cockpit. They look very cheery and bright, but how much power do they consume? What will this cost the power conscious cruiser who is hanging at anchor and must generate all their power to run everything? We went out to the local ACE hardware in Grenada to get some lights and find out! Back to ACE hardware in Grenada where the very friendly staff replaced the transformer as well as the lights and tested the new transformer to see worked properly. Back on board again for a test. We string the lights and plug in. Perfect. But what does it COST us in power to run this. Checking the ship’s main power monitor - the MasterVolt Shunt display indicates the whole setup is using just about 6 watts - thats half an amp at 12V. Whoa!! That is great! Comparing it another way - our old anchor light used a 10W bulb and we ran it every night at anchor - but all these 100 christmas lights together are just 6watts and that even includes the transformer. One of our old reading lights on Two-Step used more power than this! 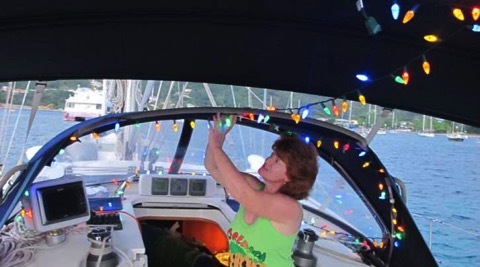 So what does it cost to decorate the cruising boat with Christmas lights? Not as much as you might think! 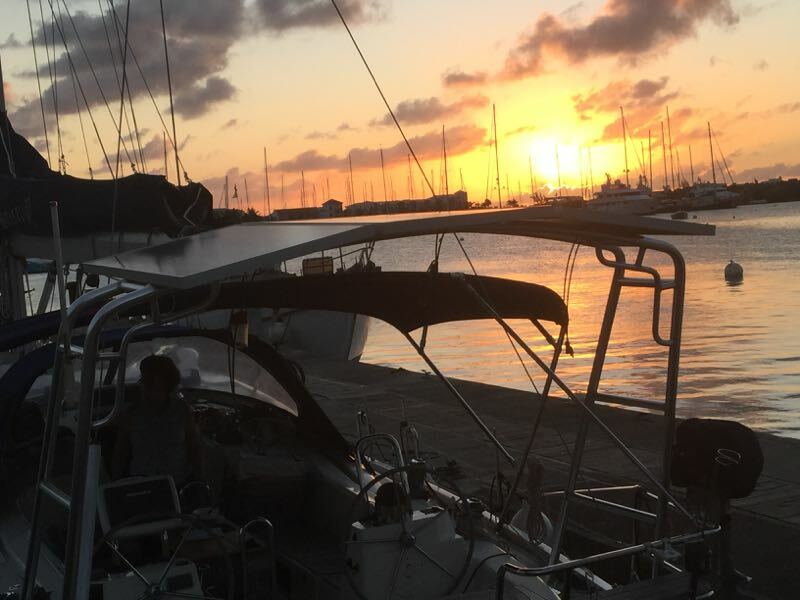 We left Distant Shores II in the water here in Port Louis Marina in Grenada. It is a lovely marina and we had just planned a short trip home, but ended up staying home for 8 weeks. Normally we will haul the boat out and lay it up for a 2 month period, then the batteries are shut down. In this case we left the boat plugged in and basic systems switched on - bilge pumps, alarm etc. When we came back and opened the boat last Wednesday, the batteries were overheating and the whole compartment was too hot to handle! I estimate it was 100°C. Yikes! I disconnected the charger, we aired the boat and slept. Clearly the batteries were ruined and we very nearly had a fire on board! First thing in the morning we called Mike Hulbert our contact at our excellent yacht insurance company - Pantaenius Yacht Insurance in the UK - who passed our info on to claims. Simon Firth was next to be in touch from Pantaenius and had a surveyor over to the boat in just a few hours! Shout out to both Pantaenius and surveyor, Bob Goodchild, for such quick service. Bob did an inspection and measured the temperature of the batteries with a laser heat sensor. I must say here that I believe the Mastervolt Batteries we have installed on Distant Shores II (and were also on Distant Shores) are the best batteries we have ever had, and are the highest quality AGM batteries available. Electrician, Alan Reynolds, from X-Marine who later came to do an inspection and wire up the batteries as required by the insurance company, also agreed that they were top quality batteries. 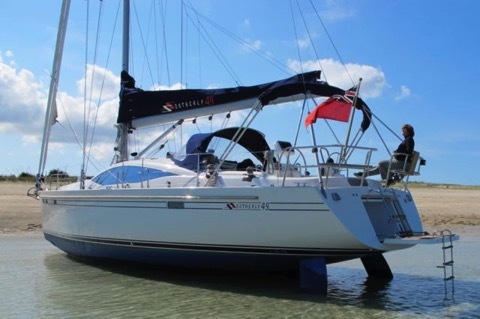 We have been cruising nearly full time for 4 years, and their capacity appeared to be still as good as they were when we took delivery of Distant Shores II in England in 2010. The batteries are sealed AGM and obviously hot gases had caused them to expand - but they didn’t crack or burst. Mastervolt make incredibly tough and well engineered products. They have an excellent and well justified reputation in the marine industry. We must determine what transpired to cause this and are naturally keen to make certain this never happens again. We have looked at the clues and tried to reconstruct a series of events that could explain the problem. If the shore-power breaker somehow tripped off then the battery would be drained over a period of days - flattening the battery. If this continued to draw the battery right down to 0V then one of the cells might be damaged? When the power came back on the charger pumped power in but couldn’t charge the batteries due to the bad cell. The battery bank might heat up. AGM batteries are somewhat more susceptible to thermal runaway but the excellent Mastervolt Charger is designed to detect the high heat and shut the charger down. It has a sensor to detect battery heat and turn off the charger. We may never know exactly what occurred to cause this. But one major factor appears to be the battery charger did not shut down the charge even when the whole compartment overheated - reaching nearly 100°C. The charger is supposed to cut current off if the temperature reaches 50°C. Here is the black matchbox size temp sensor installed in the battery box. I emailed Mastervolt technical support with photos. They wrote back directly. The sensor is wired up to the Shunt Battery monitor instead of connected directly to the Charger. So the charger doesn’t get the info on battery temp. I will buy another sensor and connect it to the charger directly. This will prevent a recurrence of the thermal meltdown we found when we returned. However this does highlight a deeper problem which I think is common to many marine power installations. Our boats have become technically complicated, and if one component fails the resulting cascade of problems can be severe. If we are on board these will likely be caught by the observant boat owner, but if unattended the problems can multiply. My hope is to add a system to monitor the vital stats of the boat when we are away. The Mastervolt Slimline batteries are an unusual shape - tall and thin, and I was worried we wouldn’t be able to replace them easily. What a surprise to find Island Water World here in Grenada actually had 3 of them in stock - on sale no less!! We bought all three. I will get the fourth at the next St Lucia in a couple of weeks. Although I normally do all the electrical work myself, Pantaenius wanted us to have an electrician check over the whole system. Alan came by (on a Sunday!) to check out the system , connect up the batteries and wrote a comprehensive report. I am investigating monitoring options to see if there is a way to have a device that would call us if error conditions exist. 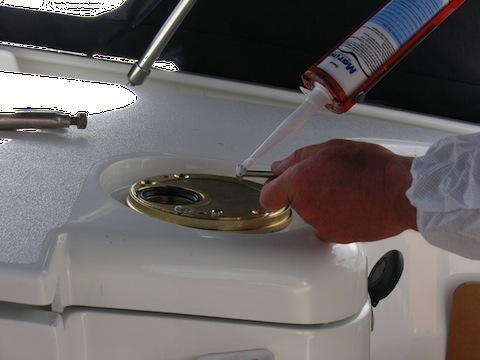 For instance, if the bilge pump comes on, voltage of the battery goes below 12.5 volts, or above 13.8. Mastervolt have a GPRS interface for their network that appears it might do what I need. It sends a text message with the info that is available on the power system (volts, amps, temperature etc) but I don’t think it can trigger an alarm if the bilge pump is on. If anyone has experience with such a device, or experienced a similar problem, please chime in with comments below! 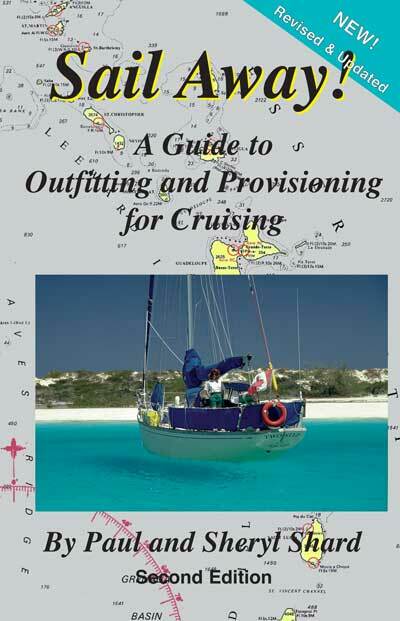 This book went on to sell nearly 11,000 copies and we are happy that so many people have told us the book helped them fulfill their cruising dreams! I checked this morning on Amazon They have 4 "new condition" copies on sale from $153-$363 - Yikes!!! 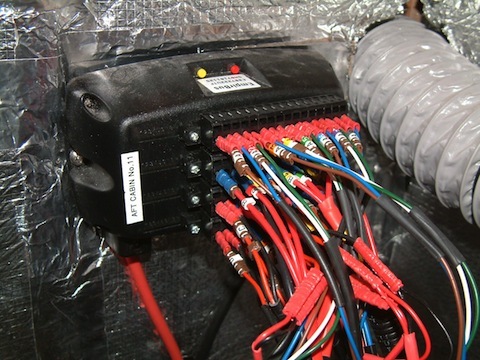 The most common electrical problem, especially in saltwater, is corrosion causing a bad connection. 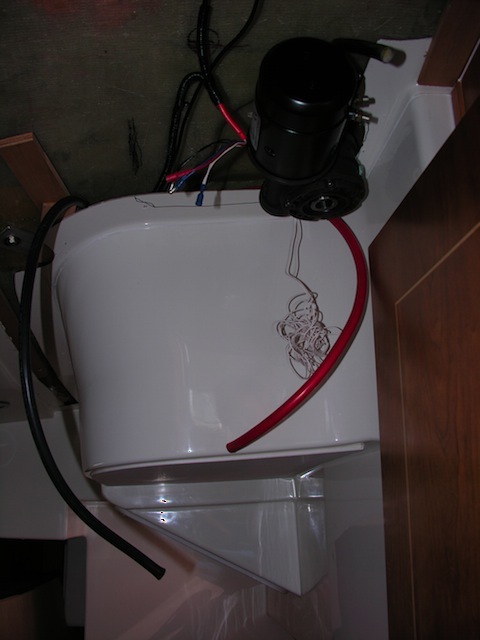 This problem is not confined to wet bilges and areas where saltwater leaks onto and actually touches the connections. Even the salt air holds sufficient moisture and salt to start corrosion on terminals. Different metals react to this corrosive environment in different ways. Plain copper wire, for instance, is susceptible to corrosion -- it turns the characteristic green of copper roofs. The best wire for use on a boat headed for saltwater is “tinned, stranded copper wire”. Stranded copper wire refers to the fact that a large number of fine strands of wire are run together inside the insulating core. This means the wire is much more flexible and less likely to fatigue and break if bent repeatedly. (Single strand wire commonly used in houses should not be used!) Tinned copper wire has a fine coating of tin on the outside of each strand and this is far more resistant to corrosion than plain copper. Any projects where gear is added to a boat should be done using tinned copper wire if possible. 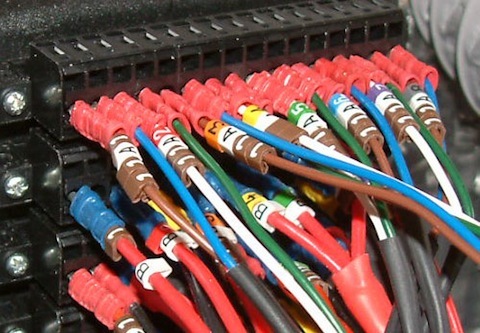 A surprising amount of marine electrical gear comes with regular copper wire. I usually solder these bare connections before doing anything else. Even if I am not installing a new pump right away I lightly twist up the exposed strands and melt a drop of solder onto the wire. It protects it while waiting in the locker to be installed. Many boats are wired up with crimp connections and I believe this is the best solution to the question of how to connect two wires. Experience on Two-Step and Distant Shores has shown that these connections last well BUT only when the wire being crimped is tinned first. If you don’t have tinned copper wire then it is best to protect the ends of the wires first by soldering them before crimping, when adding equipment. Then crimp a connection onto the wire and get a much better connection between the wire and the crimp fitting. Use closed end crimp connectors since they are more reliable in the event of a connection becoming loose. Caution: Do not use acid core flux solder on any electrical connections. It will cause failure when least expected! Use rosin core solder only. 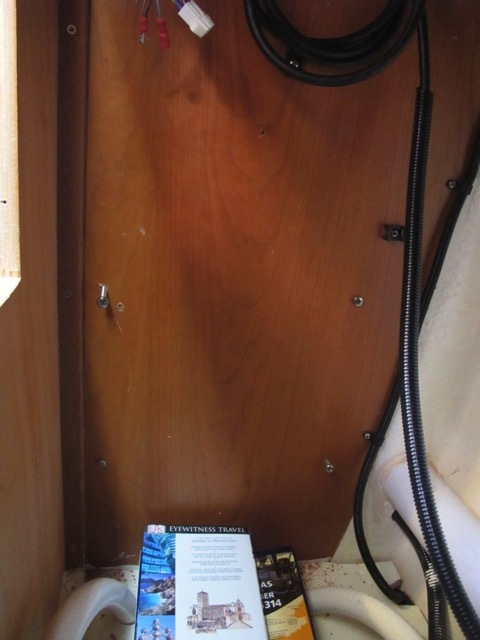 If the boat’s original wiring involves regular untinned wire with crimp connections, check any connections in damp areas and make sure they are watertight. You might be able to slip an insulating piece of heat shrink tubing over the terminal or wrap with self-amalgamating tape to protect them. Incidentally, a copper wire that has gone green will not accept solder until it has been cleaned first -- I sometimes pull the strands between a piece of fine sandpaper a couple of times to clean them. Yes I have to put in a plug for all those iDevices we have on board! iPods, iPad and 2 iPhones, plus 4-5 other things that charge using a USB cable at 5Volts. I realized they were taking up most of our normal 230Volt outlets, some plugged in with adapters. Then I saw this excellent small 12Volt plug that has 2 USB outlets built in. Its for sale at one of the local super-chandleries Budget Marine! 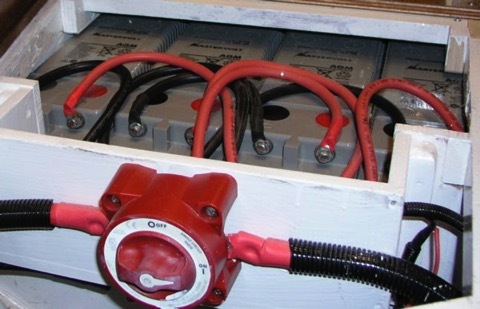 Its made by Blue Seas who make many high quality electrical systems for boats. It’s nice that it connects right into 12Volt so you don’t have to run an inverter and double-convert to run the special chargers. And its better than the typical cigarette charger since it has 2 outlets in one. It was just $29, so we bought 2!! Blue Seas even lists on the specification that it has a small "parasitic" draw of 15ma. Parasitic draw is what it will use when plugged in but not in use. I am impressed that they list this since it is important - and nice and low compared to leaving a normal charger plugged in. How many USB charged things do you have onboard?? Atlantic Rally for Cruisers (ARC 2014 edition) is getting underway tomorrow Sunday November 23) and I know everyone there will be scurrying around with last minute jobs, enjoying the last parties and getting ready for the start line tomorrow morning. It is a VERY exciting time and Sheryl & I wish all the participants Fair Winds and Smooth Seas. 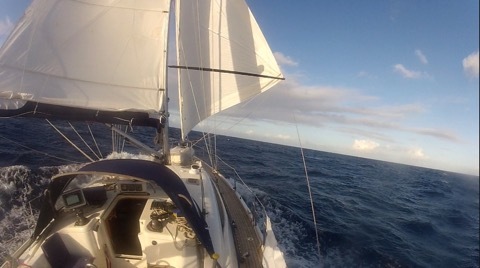 We did the ARC in 2012 and thought it would be worth republishing summary of how systems worked for the boat in our “quite windy” running of the Atlantic Rally for Cruisers. 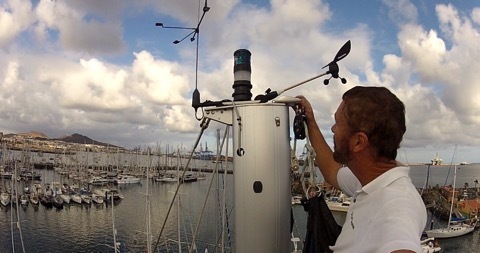 Before the start of the ARC in Las Palmas everyone was working on their boats and getting them ready - trying to prepare for all the conditions we would encounter in the 3000 mile crossing. Getting all the boats systems up and in top condition and preparing for all the contingencies. Trying to anticipate what could go wrong and how would we deal with the problems? Here is a very un-scientific summary of how well systems, and backup systems, worked for boats on the ARC 2012. 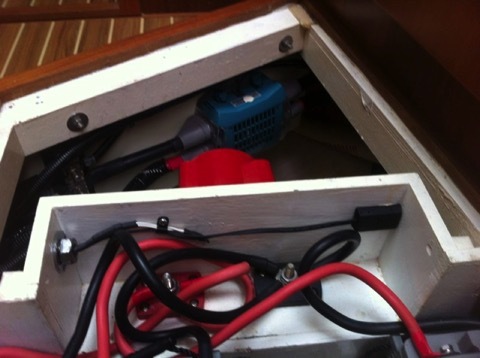 On this year’s ARC many boats reported problems with their electrical power. A number of boats had a malfunction with the main generator but were able to recharge the batteries from the engine. However most engine alternators produce less than you hope. The modern yacht does consume a lot of power. Similarly wind generators often do not work well when sailing downwind. 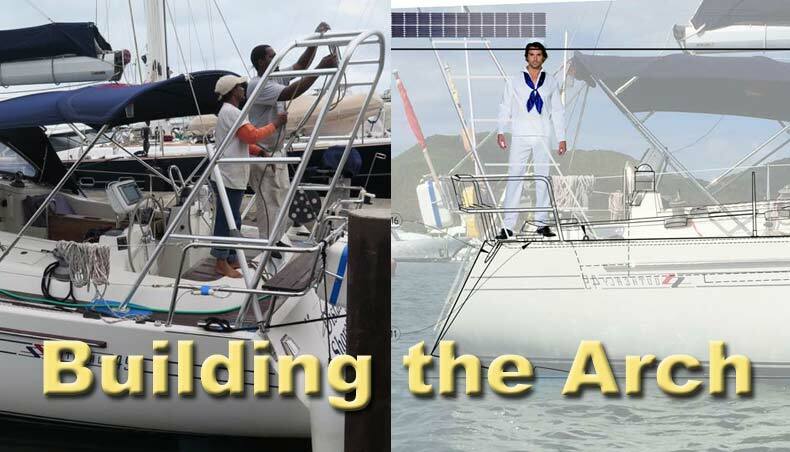 And even the biggest solar array produces less than the typical modern boat uses on a passage. People with power problems had to turn off fridges, turn off autopilots (so crews were exhausting themselves hand-steering for thousands of miles !!!) and otherwise conserve power. The worst cases were boats that lost their engines and had no other way to generate power. In this case they finished the passage with no power left, in the dark! What is your primary method of generating electrical power? 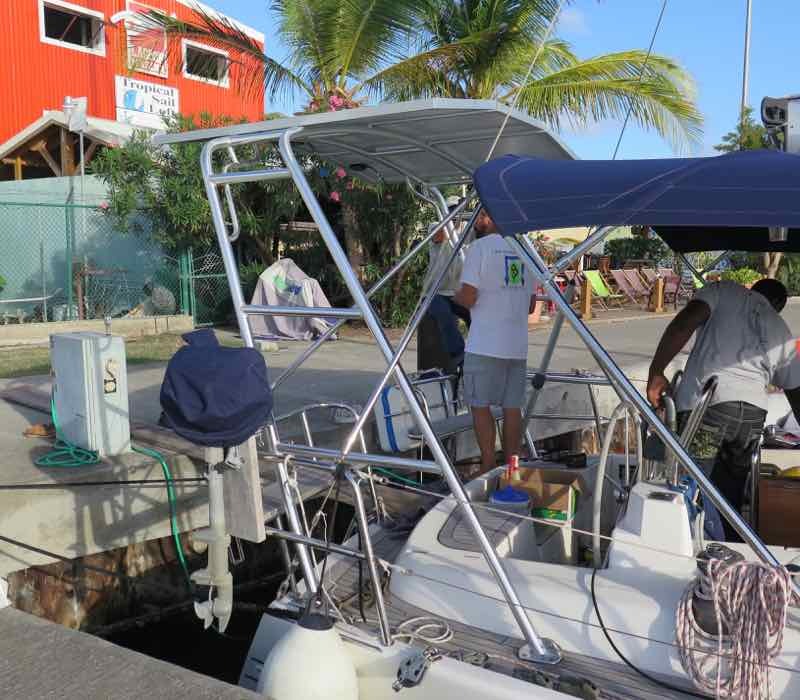 Most of the larger ARC boats have a separate diesel generator, and many of the yachts less than 45 feet rely on the engine’s alternator to recharge the batteries. Some also have a reasonable capacity to generate electricity from Solar panels or Wind generators. A number of people I spoke with did not know how much power they use. 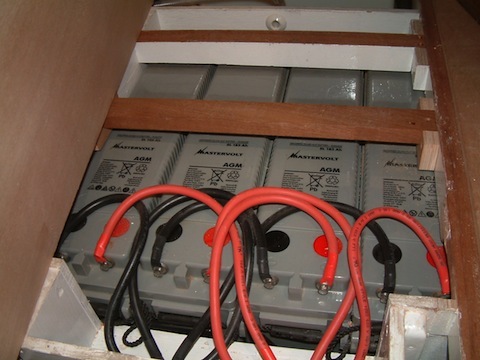 Many boats do not have a decent way to calculate how much they are adding/subtracting from their batteries. A quality power monitoring system is a must! Its essential to know how much power your boat uses on a passage. 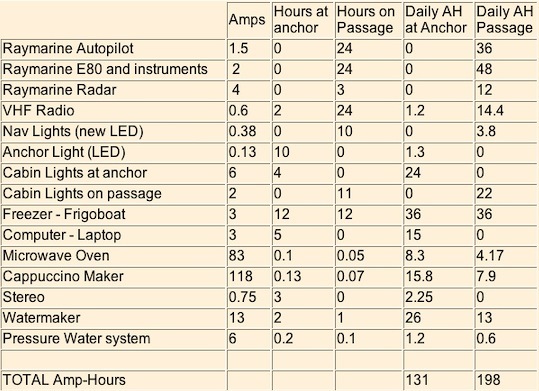 Refrigeration, autopilot, lighting, Nav instruments are all big users on passage and running 24-7 adds up! Some of the boats had left the cold northern European waters and were surprised how much more power the fridge consumed in a hot climate. Others just hadn’t done the math or worked out what they would need. 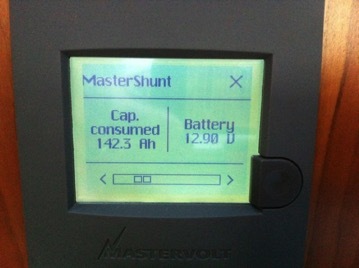 If you have a quality amp-hour meter such as Mastervolt’s Mastershunt - it will show what power you are using at any moment, total used since last full charge and other info such as the percentage of charge you have left in the batteries. You can use this to help estimate the power you will need for a passage. For more information on how to calculate an electrical budget click here. On Distant Shores II we are using almost 300 amp-hours per day on passage. This mean we need to run the generator 3 hours per day to put it back in. If the generator quit we would need to run the engine 4-5 hours a day for the equivalent power. We could also cut back by shutting down our freezer and/or fridge, turning off our plotter etc and would reduce power use by probably 50%. If your backup power is solar panels, you may find it will not cover typical power requirements while on passage. But it is a great backup system with the main drawback being much lower production on the cloudy days we had, especially at the beginning of the crossing this year. Whatever you do - consider your power requirements carefully, and plan a backup strategy to generate power in the event your main system goes down. Self-steering systems and autopilots were another area where ARC boats had a number of issues. Heavy conditions in the first week broke quite a few wind-vane steering systems. Quite a few boats found themselves hand-steering when they had an electrical problem and had to save power. On Distant Shores II we have a Raymarine autopilot connected to a robust Lewmar drive unit. It steered flawlessly the whole way right up to the finish line! The boat, a Southerly 49, is quite easy to steer with her twin rudders and has a well balanced helm so the motor isn’t straining and doesn’t draw very much power. Here is a video showing the Raymarine Autopilot steering in some pretty big seas. Many ARC boats were relying on water-makers to provide water for the crew. Compared to the average cruising boat with 2-3 crew onboard for an ocean crossing, the ARC boats had 5 or more - and this means providing more water for the crossing. A 37-footer with 7 crew, and a 40-footer with 9 on board will need quite a lot of water. On board Distant Shores II we carry 545 litres of water, and had just the three of us (me, Sheryl and friend, Matt Heron) on the passage. I have installed manual foot-pumps at the galley and in the aft-heads, which we use at sea, and turned off the pressure water system for the crossing. This helped us easily conserve water, and also meant that if a leak developed in the system we wouldn’t dump all our fresh water! In the event, it was great having the foot-pumps. We did save water without feeling constrained and arrived at the finish with more than a third of a tank remaining. We switched the pressure system on whenever we needed it (when having showers for example) but mainly left it off for the passage. A number of boats had engine problems - the most major issue being a propellor drop off, to simply being unable to get the motor started. But everyone with this problem was able to sail right up to the finish line and then accept a tow into the marina. Many boats had problems with various communications systems - but since everybody had backups of some form, no one was seriously inconvenienced. For example, our SatPhone stopped receiving EMail for 4 days, but we were still in touch with nearby boats over the radio and we could also make phone calls so reports could still be filed, and the Yellowbrick tracker kept on working fine. Communications upgrades! Probably nothing has changed so much in the last two years since our ARC 2012 as communications. 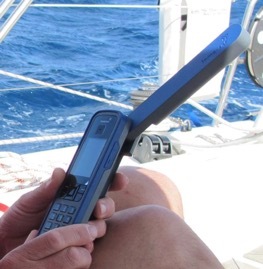 New Satellite phones, the Iridium Go, Inreach and other devices have all come online. If anyone has tested these out please chime in with your thoughts and experiences. Wiring - getting a handle on it! 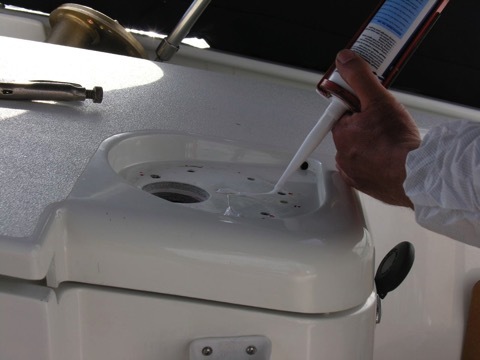 With any new boat comes the process of familiarization with her systems. 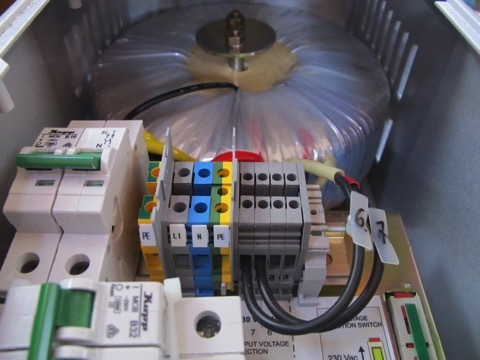 In this case the electrics are based on a distributed power system. Engineer Ian installed the whole system (in fact all the mechanical systems in the boat) and he came on board yesterday. I got him to show me around the system a little. Ian does excellent work - he did all the mechanical and electrical work on the 42 as well. The work he does is very well thought out and very neat and tidy. As I start installing a few things I will try to keep to his high standards. One thing you see in this picture is just how “uncrowded” it is behind the main electrical panel. This is because the distributed electrical system means only items installed near this area will be wired to here. Other items will be connected to “nodes” near that part of the boat. 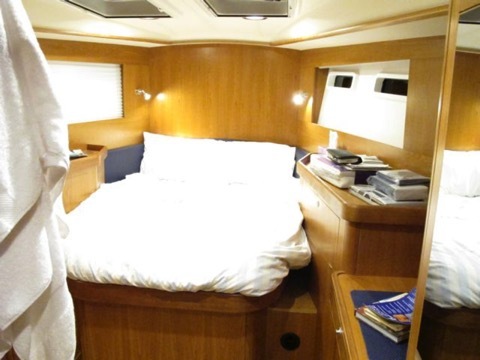 There are nodes in the forward cabin, saloon, galley, nav station (shown here) and aft. There really is much less wiring this way. On the lower left of this picture there are 3 square black boxes. They are the circuit breakers feeding three nearby “nodes”. So each node is protected and can be isolated. My next project is to get my head around the software that programs the nodes. I am planning a few small projects I can add to the system that will be simple examples I can practice with. We took the new boat out to anchor for the first time a couple of nights ago. It is great to have the time to be testing systems and sorting things out without being in a big hurry. It is just early spring here and we were the only people in a normally popular anchorage in Chichester Harbour. Also a chance to do some real world testing with the Imtra LED lighting. WOW. We already new the lights looked great from seeing them on at the boat show in January. But now I have been able to see just how little power they use. I did tests on most of the lights at anchor. I have a few interesting pix below. Of course it is difficult to get a representative feel with the camera but I did my best. The camera must be set to all manual operation so it doesn’t adjust for dimmer lighting. 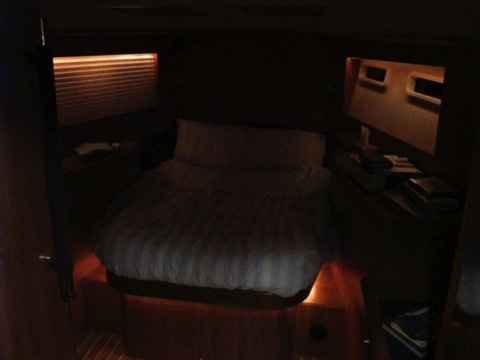 This is the forward cabin lit by 4 big downlights in the ceiling plus the two reading lights at the head of the bed. Together the 6 lights draw just about 2.5 amps. To put that in perspective that would have been just over ONE 25watt halogen. These lights are so efficient we can just turn them on at anchor whenever we want. No worries about power. The saloon was the same story. 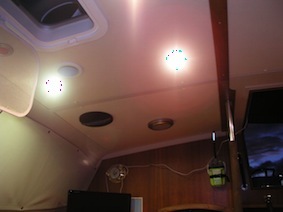 The 6 big downlights light the saloon and galley with a nice warm bright light for just 2.5 amps. This compares to the 42 (similar space but lit with halogen lights) which used over 10 amps. So we have cut the power needed to run lighting by 75% or so! LED lighting really is here now. You can get very good looking light that will save a lot of power. And remember that saving power means you don’t need to generate and store it as well. So saving the power as we sat at anchor meant we didn’t have to replace that power the next morning. If you are planning an electrical budget you can stay with slightly smaller batteries. I have mentioned before that the new Southerly 49 has a distributed power system. I took a few photos of this the last time I was over but they didn’t come out, so I asked Southerly Engineer Ian to send me a couple of shots. 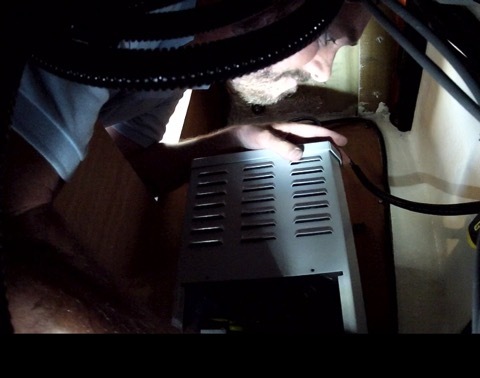 Ian is has been doing the electrical and machinery installations on our new boat and as you can see from the photos he does meticulous work! Thanks for the pix Ian! Here is a close up of one of the EmpirBus nodes. This one is in the Aft cabin so any wiring in the aft of the boat will come here instead of running all the way up to a main circuit panel. Note the sound insulation. This is a compartment just aft of the engine box and although it wouldn’t strictly need to be insulated, they have done it just to make extra sure the boat is quiet! Now here is a close up of the wiring to the node. 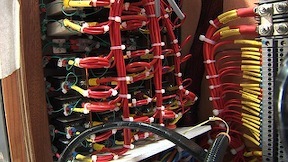 Main power to the node comes in the lower left with the big red wire. (negative is hidden in this photo). The individual circuits and control wires are all neatly labelled. Here you can see the wires are all coded. 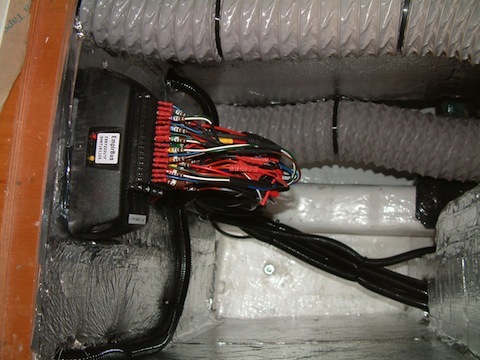 Both ends of the wire are named and the codes are recorded in the wiring diagram for the boat. Note Upper left wire is “11A1” meaning Node 11, Block A, terminal “1”. With a distributed power system the functions of each node are programmed by software. 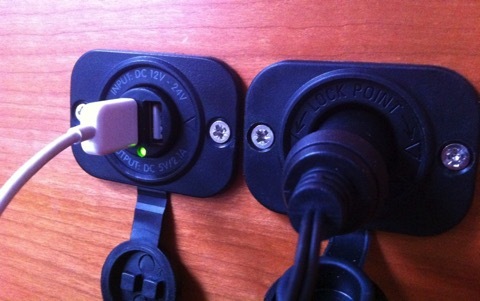 So you do need to know exactly which you have plugged into. Then you tell the system what you would like that terminal to do! Example: Deck Flood light. On a traditional boat this would have a switch at the main wiring panel. But now we can do more than that. First the deck light is connected into a node to give it power. Then assign a switch that can control it, perhaps at the main panel. But we could also program one of the switches at the helm to turn it on. And say we wanted a kind of “Alert” switch in the forward cabin in case we had an emergency. Simply program one of the switches in the forward cabin to do a few things. It could turn on the saloon lights plus the deck flood and cockpit lights all at once. This could just as easily be done at any time. There would be NO additional wiring to do this at all. There will be some more learning to get familiar with the new power system but the benefits will be well worth it. Ian also sent some pictures of the main battery bank installed. We have four large 185AH Mastervolt AGM batteries totalling 740AH capacity. Another neat installation and with the boat’s raised saloon they are able to install them centrally and keep the weight over the keel. I just got back from a very quick visit to England to see the new boat. Exciting!!! Its just over a month now until the boat will be moved to the Excel Centre in London in preparation for the London Boat Show. Here’s a picture of the inside - still lots to do! One of the most interesting engineering features of this model of Southerly is that she uses the leading edge “distributed power systems”. 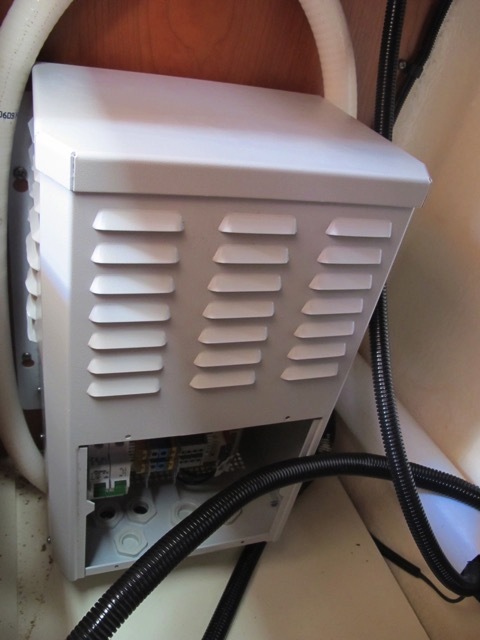 This means instead of a big main breaker panel there will be nodes throughout the boat that control the electrical system closer to the item being controlled. Distributed power has two main advantages. 1) It allows much more control and monitoring of the use of electrical power. And 2) It reduces wiring by and the massive bundles that used to make their way aft to the panel. 1) Any circuit can be controlled from any switch in the boat. For example, the deck light can be turned on from a lighting panel but also from a second switch that also turns on the cockpit lighting. Or anywhere else you wanted. Each switch is programmed with what it will do. And you can change that later - no rewiring, just connect your laptop and tell the switch to do something else. Or add a switch anywhere and tell it what it will do! Power can also be monitored and logged. Example would be tracking and logging how much power refrigeration uses. Or how many times the bilge pump came on. The monitoring of the system is the aspect I am most interested in! 2) Reducing wiring and the complexity of the main electrical panel. This has been building for years as boats have got more and more equipment. Proper wiring protocol means all these must come back to the main electrical panel. So on a modern 40-something sail/cruiser you could have a bundle of wires as big around as your arm. 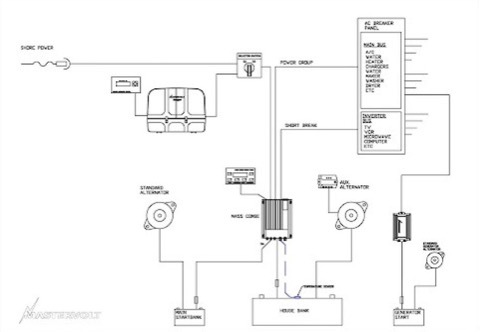 With a distributed power system you just wire the devices up to the nearest “node”. Below are two nodes (each with 10 circuits available on them) in behind the saloon seating. (they aren’t all wired up yet so there will be more wires). If I ever wanted to add something I could just look for a spare connection on the nearest node. I could also add another node if they were all crowded. Finally it looks like interior lighting can reasonably be done by LEDs! For a couple of years now there have been workable LED Navigation lights, but we had not found a true interior “down light”. Every time I had tested a replacement bulb for the interior it came with glowing and completely unrealistic claims. “50,000 hours”, “no heat”, “saves power” and “replaces a 20 watt halogen bulb”. We have a large bag full of all the rubbish bulbs I have bought and found to be lacking. 50,000 hours - this claim is merely stating the LED manufacturer’s claim that LEDs themselves can last that long before losing too much brightness. It is rarely based on testing by a reputable light manufacturer. The LED light itself consists of more than the LED - there is a circuit called a driver that supplies the LED with the correct voltage and current. Then there is the connection of however many LEDs are used in the light. These have often been quite amateurish looking like someone soldered it all together in the garage. hardly fit for the marine environment and certainly not tested for 50,000 hours. We have had bulbs fail in less than 200 hours. No Heat! - Another silly claim. In our experience LEDs that produce no heat also produce almost no light. The old LEDs that had 30 small LEDs clustered together didn’t create heat but were so dim we found them unusable. 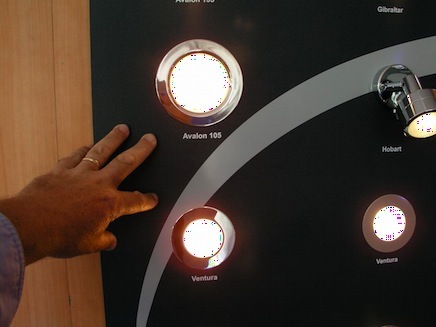 The fact is that LEDs radiate very little other than visible light so don’t feel hot like a halogen bulb. But the driver circuits produce heat. “replaces a 20 watt halogen” - This seemed to mean they would fit the same fixture. Bulbs we tested before this year didn’t match a 10 watt halogen for output, let alone a 20 watt. Specialised LED lights. I think part of the problem is that LEDs lights need to be made from the ground up to work with LED technology. 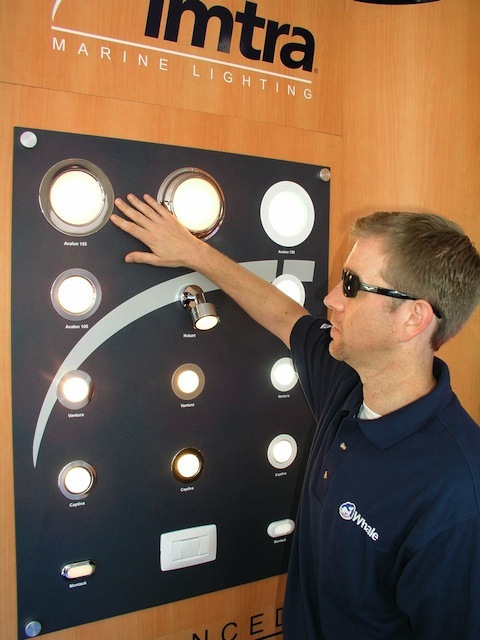 Create a housing to marine standards that includes the LEDs, driver and reflector. Test them for light output and compare truthfully to a baseline halogen light. 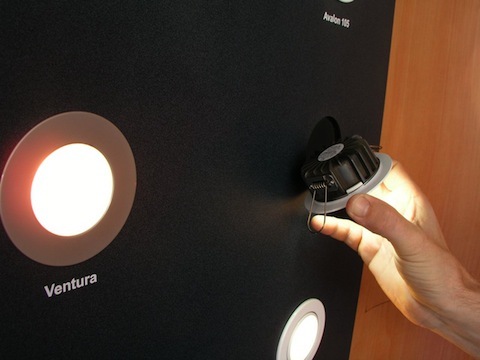 IMTRA has made that commitment to LED lighting. Their stand at Southampton is outside in a bright environment - all the lights are installed and running and are designed from scratch to accommodate LED technology. They have advanced drivers and the lights really are bright. Derek from Imtra in the US was at the show and demonstrated the latest from their extensive LED range. I am FINALLY happy that these lights can really replace the halogens and save power. The lights he showed me are proper replacements for the 20 watt halogens really creating that much light. They use more power than the LEDs I have previously tested since they REALLY DO produce the light. Yet still they use just 5.5 watts each (saving almost 75%). And they look well built with solid heat sinks on the back to absorb the heat from the driver circuit. - Raymarine Exciting new Radar and Plotters! The Southampton Boat Show begins this weekend and Sheryl & I are going! We went in 2007 and quite enjoyed it. The show is a pretty big in-water boat show and its a nice venue. This year Northshore will be introducing the new Southerly 49. 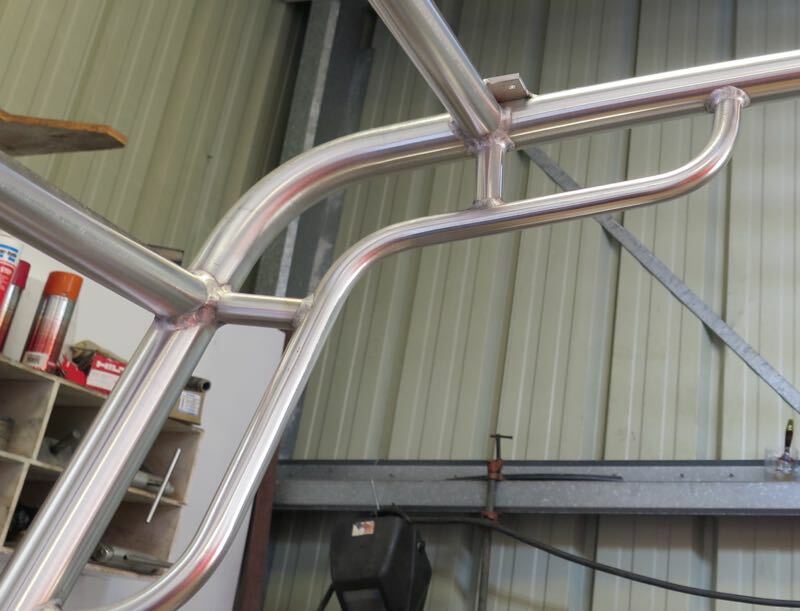 Of course we will also be dropping by the factory to see how our 49 is coming along!! I expect big changes since we saw it in early July. The 49 takes almost 6 months to build so we are just approaching the half-way point. We also like the Boat Show in that it lets us look at all the latest equipment. We are just finalising the design on the electronics with Raymarine and very keen to see what is new since we set up our Southerly 42. New versions of the chartplotter, AIS, and radar are available I think - will report back! We are also looking at LED lighting. This has been an area where I have been severely disappointed in the past :-( I have bought a number of LED bulbs in attempts to save power but almost all have been either very dim, sickly blue or have died prematurely. The picture above was my best of many bulbs tested - it is almost as bright as the 10watt halogen it replaced and is just slightly greener. Unfortunately it doesn’t work with the dimmer we have on the saloon lights. I am forced to say LED replacement bulbs are not the way to go. I think LED lighting finally does work but at least for marine lighting it doesn’t make sense to buy a bulb to put in an old fitting. The best is to get an LED light bulb and fixture designed from the ground up for LED technology. Anyway, we shall see what’s at the show. If any readers are going to be at the Southampton Boat Show, please come and say hi. Sheryl and I will be at the Northshore booth various times over the first weekend (September 10-12). Well we have lived on Distant Shores for almost 1 and a half years now and I thought it was time to revisit the issue of Battery Capacity. How did my original electrical budget work out? How do the Mastervolt AGMs work? Did we use more or less than planned? The budget was fairly close. Of course it is always hard to judge in advance what total use would be and there are going to be changes based on where and how you cruise. Luckily our Mastervolt power system includes a battery capacity monitor so we have been able to see total power used and judge how we are doing. Basically our budgets were fairly close... most of the time. I said we would need 130AH while at anchor. This is true if we anchor and swim/read/explore etc. The difference is if we get out the computers and do a few hours of work! On Two-Step we didn't do that often since there wasn't really space. But with Distant Shores we have the space and occasionally have a day at anchor where we catch up on work, emails, and even some rough editing on the television show. The computers are power users and put us over our budget. Running a typical laptop will use 3-4amps so running both of ours for 5-6 hours is a big 40 addition to the budget. At sea was where I had thought we would be closer to the line with a budget of 200AH per day. This has turned out to be close. I think it is around 220 in practice. 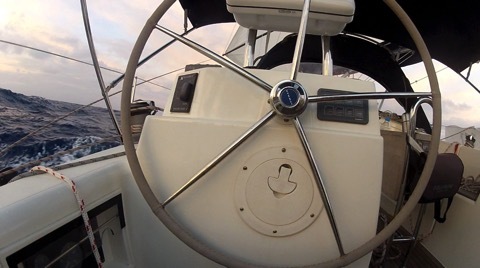 Luckily the boat is very easily steered and the autopilot uses less than Two-Steps pilot to keep her on course. But the instruments are fairly heavy users. We have two plotters, the big E120 down in the nav station and the Raymarine E80 out in the cockpit. Those both use a fair bit. They are wonderful devices and well worth it but I didn't budget correctly for them. The E80 draws roughly 2 amps and the E120 about 2.5. Then I discovered that it wasn't really the plotters themselves, but the backlighting. So at night when we dim them the draw is almost 1/2. At any rate, the budget for the ship at sea is really around 220 AH. This is really a bit close to the line with the batteries we have. Our ships battery bank includes 2 big house batteries. David at Mastervolt wanted us to use 3 - totaling 675 AH of house capacity. I decided the 42 couldn't accommodate all three since the third would have had to go in a separate custom battery box. So we have two totaling 450AH power and on long passages we have to run the engine more than once a day. In practice we run the engine for an hour each morning and evening. If we were to do it again I would find some way to follow David's recommendation and fit 3 of the big Mastervolt AGM. How have the AGM worked out? Well these Mastervolt AGMs are my first experience with the batteries and they are brilliant. AGMs charge quickly, do not require maintenance, do not vent fumes and do not discharge themselves when left for a while. All in all they are great. On Two-Step we used to be checking our batteries, filling them with water regularly and cleaning up the spills. The AGMs just sit there and look just the day they were installed. Note the black thing that is stuck to the left hand battery... this is a temperature sensor. To look after any battery is important to having them give good performance over a long life. The temperature sensor ensures that the big 100Amp battery charger we have is not over heating the batteries, and that they are being charged at the correct rate. Got to run! Next time I will report on my recent visit to the Northshore Yard (builders of our Southerly 42). We just had another visit to the Northshore yard in Itchenor. "Distant Shores" (the new boat) is coming along great. Right now the final electrical and mechanical systems are going in and we met with David Payne of Mastervolt to inspect the electrical systems. As a cruising boat this couldn't be further from Two-Step. "Distant Shores" has a completely modern and advanced electrical system including a Generator, charger/inverter, isolation transformer, and triple the battery capacity of Two-Step. For more info on the electrical system see my blog entry on that. The Northshore team are doing a really great job on the boat! Having built our first boat I have an appreciation of the thought and work that goes into building a boat. Ian, the engineer doing the installs of electrical and electronic gear is just excellent. I am afraid to say I would have been wasting time trying to figure out how to do something that Ian can do much more effectively. They have done almost of this stuff before and even if we have some new combination of gear to be fit in, Northshore's background of having built over 700 boats means some people there have experience with the right way to do things. No corners are being cut. As an example - we are having Mastervolt AGM batteries fitted for both the main ships bank and also the generator and engine starting battery. 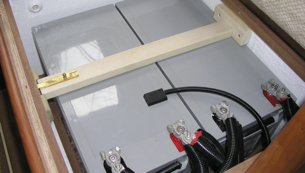 CE and ABYC standards state that batteries should be in vented lockers. But this regulation was obviously intended for standard flooded batteries - not AGM or Gel cells which are sealed and do not vent gas while charging. I myself might have been tempted to install the AGM batteries and not bother with the vents - but not Northshore. 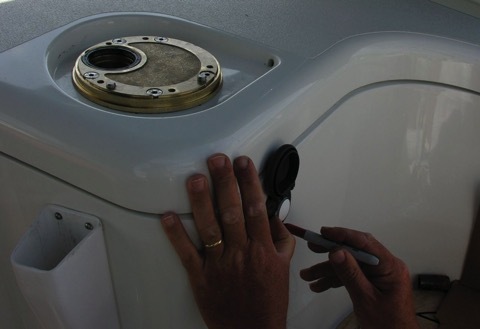 They have done the best job I have ever seen on a vented battery box - running high quality breather tube to a beautiful stainless vent in the transom. The whole boat is being built to that standard. Take a look at the back of the main electrical panel. Beautifully installed and so tidy it will be a joy to maintain this. 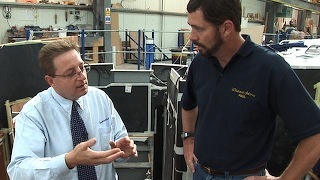 Mark - who designs the electrical systems at Northshore has worked there for 27 years. The work he is doing is excellent and the systems shows the knowledge they have amassed over the years. In fact many people have been working there for more than 2 decades. Next big milestone will be to put the deck on. So far the deck has been separate, and equipment is being installed on it as well. It will stay off until the last minute. It makes it much easier to do installations of large or heavy equipment since the overhead crane can be used. We shot this last visit when Ian was fitting the generator. But now the launch is getting closer and much of the work in the hull is complete. So the deck install is imminent! Stay tuned! This means you calculate the capacity of battery you need to be double the budget numbers we did. To provide 200ah of capacity we should plan a 400ah house battery bank. Then we would be able to discharge it to 50% with one day power use while passage-making. I have an additional criteria for batteries - at anchor it would be nice to be able to stay at anchor for 2 days without starting the engine. If we have found a sweet little anchorage we often decide to stay a day at anchor and then leave the next day. I hate having to fire up the engine in that rest day in a peaceful cove just to be able to run the fridge! To have the power to run the ship for two days at anchor we would need 130 per day X 2 days = 260ah X 2 = 520ah capacity. Now the tough part. Where to put all these wonderful batteries? Here's the original battery compartment with 4 standard flooded batteries - 3 X 110ah = 330ah for the house bank plus one 110ah to start the engine. Luckily with the Southerly 42 there is sufficient room in the original battery box to place 3 of the Mastervolt AGM batteries to act as the house bank. We can fit in 2 of the 220ah large batteries (equivalent to the American 8D size) and one 160ah. Total capacity will be 2 x 220 + 160 = 600 ah. Only small changes to the compartment will be needed. The only problem is that this compartment was also meant to house the engine starting battery, so we needed to find another home for this. Mark at Northshore suggested a place under the floor where a battery box could be built for the 90ah starting battery. The best part of this plan is that the additional 94kg of batteries will go in the exact center of the boat where they will not affect trim. The decision to go with AGM batteries makes sense from a couple of reasons. First, the AGMs can be recharged faster than conventional flooded batteries. This means shorter running times for the engine or generator. They do not need water adding on a regular basis so we will not have to be going into the compartment and checking them every few weeks. And their sealed design means the extra battery box does not have to have such care for the venting and ease of access. 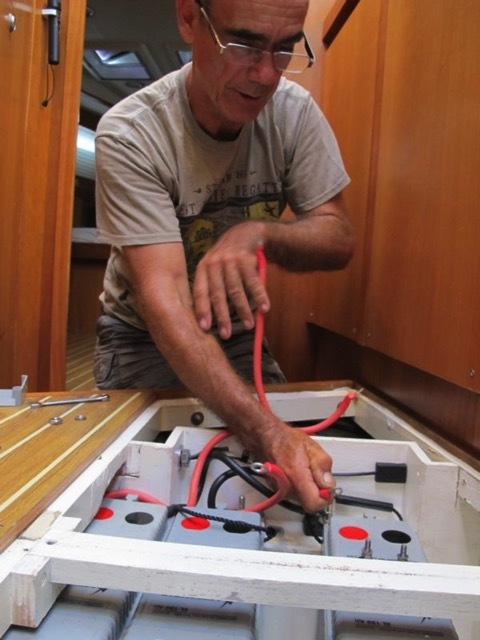 Electrical power use on a boat is one of the biggest issues for cruising sailors these days. 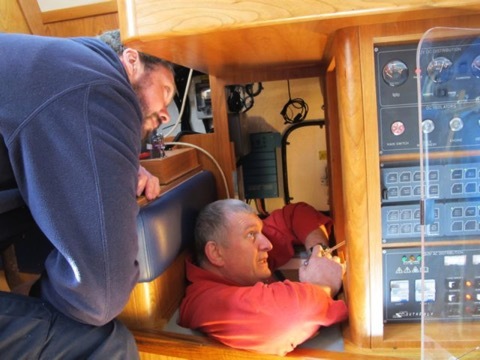 Talk to any long-term cruising sailor and they will probably bend your ear for hours about the issues and problems in providing the power for their boat. Basically your boat is an independent system when you are away from the dock. Any power you use, and todays gadgets can use a lot, will have to be supplied from the ships systems. Most cruisers find that the gadgets they have draw too much for the boat's original electrical system - and require a substantial redesign. Next we need to look at how to supply this power. There are two obvious scenarios - at anchor and on passage. 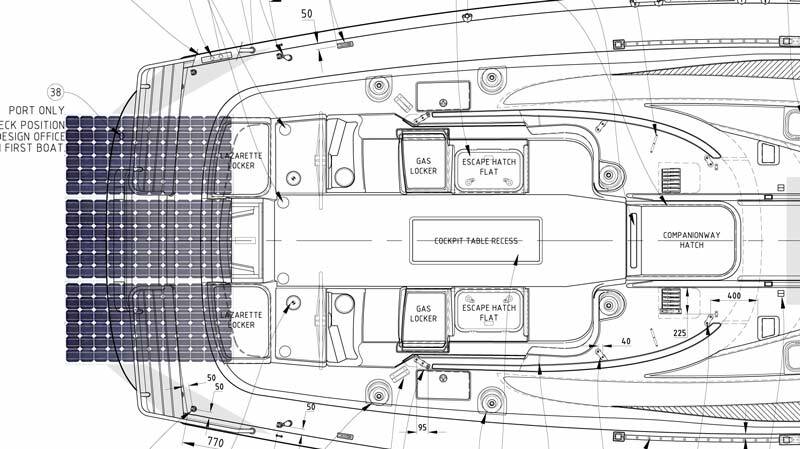 On passage boats use more power, depending on autopilot draw it can be a lot more! Luckily the Raymarine pilot is quite good on power. But also on passage you might well find a time during the day when you need to run the engine anyway with light winds. So on those days you will likely get all the power you need from running the engine. The problem is on those wonderful tradewind passages when you are sailing well and don't need to run the engine. Then you must generate the power somehow. On Two-Step we just ran the engine anyway - in neutral. So on an ocean passage we found we had to run the engine twice a day for one hour each. Solar panels helped out somewhat but it is difficult to design a system that will provide the entire power requirements from solar - especially on passage since you use so much. Solar - For our example of needing 198ah per day - we would need quite a solar farm to provide even half of that. Perhaps 3 large panels would give 100ah. I estimated a solar array would be 5 feet by 7 feet and cost $4000, and generate 100ah per day. And not if its cloudy. Wind - Typically these might give 60-12ah per day if there is reasonable wind. Unfortunately many anchorages are protected from the wind and therefore don't produce what the marketing people might claim - even in the windy Caribbean. And a typical Mediterranean summer would not provide enough predictable wind either. They are popular in the Caribbean though - and if you don't mind a constant whirring noise you might consider one. For us the whirring is too annoying. Alternator - the mainstay of 12V power generation for most cruisers. We typically used our main engine as a generator by running it one or two hours per day just to make electricity. At anchor if we are careful and its sunny (for the solar panels) then we might just run one hour per day. At sea on passage we needed to run it twice for one hour. 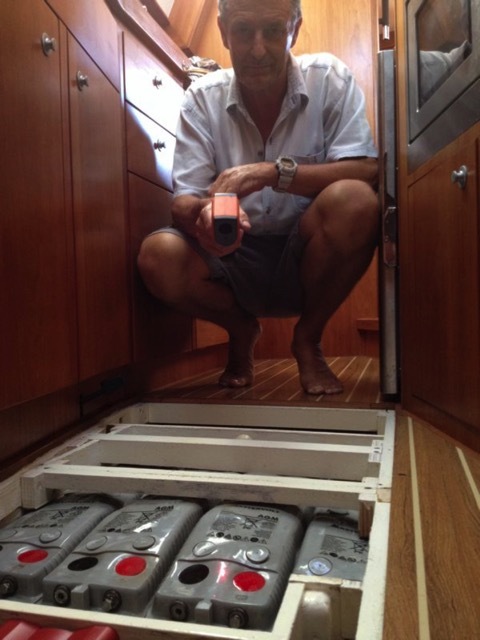 On the Southerly we will have a bigger alternator - 80Amps vs 50 on Two-Step. At sea we would need to run it at least 3 hours per day to come up with 198ah. Probably more since an 80Amp alternator is not really going to produce 80 full time for 2.5 hours. Count on maybe 60% of the rated output on a regular basis. So our new 80Amp unit might give us 50 amps - that means 4 hours running at sea and three at anchor. Generator - At the risk of oversimplifying - if you have any large power consumers on board you probably should consider a Generator. And I don't mean someone who always leaves the lights on!! A big power consumer would be an air conditioning system, a clothes washer/dryer, a microwave oven, a scuba compressor etc. 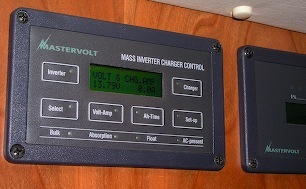 Most boats have some form of inverter to allow you to run 120V devices from the 12V batteries. This works great for small items, but running anything with real power requirements will need too many batteries to be practical. For example, running a typical small vacuum cleaner for 10 minutes would require 25ah from your batteries. Running a 120V watermaker for 2 hours would take 300-350ah. And if you did have such a big bank of batteries you would still need to put the power back in. Neither the alternator, the solar panels nor the wind generator can produce this much easily. So as you decide on more 120V devices, you are increasingly pointed to a GenSet. We have been considering a generator for a few reasons. First, the genset can easily produce enough 12 volt power to replace 198 amps in roughly 2 hours. It is quieter than the engine since they are usually very well insulated and typically installed with a dry exhaust. Best of all a generator will allow for Sheryl's and my two dream options for the new boat. A washing machine and a scuba compressor!! 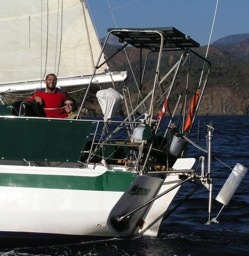 There are a number of small units meant for sailboats in the 40-foot range. The other part of a complete electrical budget is planning the AC usage. This means anything you will need to run on house current - not 12 volts. For the modern more complicated cruiser (think Steve Dashew not Lin & Larry) this includes a washer or washer/dryer, vacuum cleaner, desalinator, air conditioning etc. And if you have anything in this category that will need to be run away from the dock, then you will need to figure out how to produce the power yourself - basically a generator is the most common solution here. So for our new boat we had no option but a generator since we will have 2 big power users (washing machine and Scuba compressor) that need house current. Then it was a matter of trying to figure out which one. When Northshore did the original drawings for the Southerly 42 they took a genset into consideration. 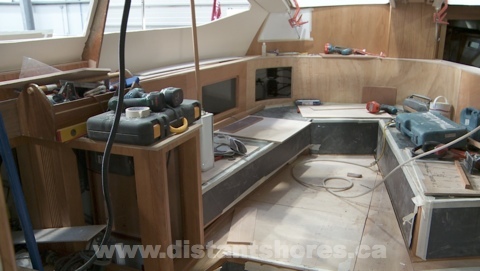 With the raised pilot house/saloon the boat has quite a large area under the saloon floor, that is also positioned nicely in the center of the boat. Many similar modern boats have raised saloon windows but did not raise the saloon seating - so there is no extra space (plus you can't see out either - go figure?!?). But the Southerly is a cunning design that provides space for tanks, generator etc right in the center where it is best to place heavy items like this. You can click on the plans for a larger view. The generator Northshore chose was a Mastervolt. I wasn't familiar with this make but when I looked into them they looked like the perfect solution. 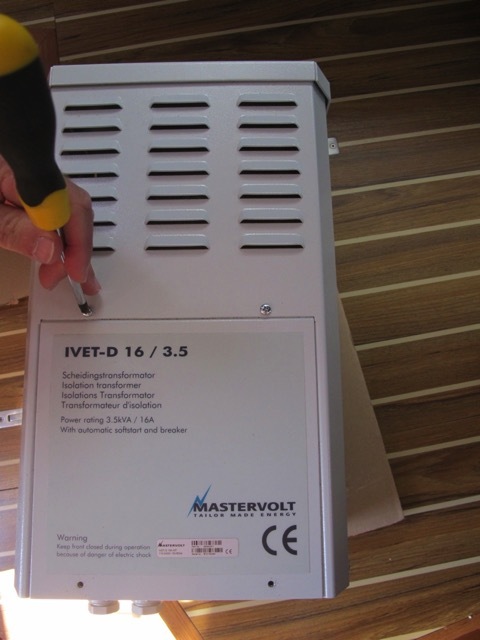 Mastervolt has a very good reputation worldwide, and best of all they make almost all the components for a boats electrical system. So you can get the whole electrical system from them and the components are designed to work together. This means that the generator is designed to integrate with the charger/inverter. The two can cooperate and add their power output together. For example, if the generator is running but there is a surge of current drawn as the scuba compressor starts up, the inverter adds in the extra needed power. This should allow us to run the compressor - potentially the largest user we will have, on the smaller generator. We will certainly report back as the system progresses. SNOW SNOW SNOW!! Its blowing horizontally outside the studio window as I write this and tonight its meant to drop to -24C. Tomorrow we are heading south for 3 weeks filming in the Virgin Islands and not a minute too soon. Although we did have fun out on the lake filming a few days ago with iceboats and Bombardiers – more on that later. The past few days I have been working on the electrical system design for the new boat. Basically all the gadgets and how many batteries we will need to run them all. As any long-term cruising sailor knows, the pile of modern goodies we have all been adding to our boats can drain the batteries pretty quickly. The question is how quickly! What you need to do is calculate how much power each device will use, and how long you will use it each day. I actually do two calculations, one for when we are at anchor and one when we are at sea on passage (assuming sailing 24 hours). In order to do this calculation you need to assemble all the information on what power is required for each gadget, and this can be the most demanding part. Traditionally we calculate this in “amp-hours” which is how many amps it draws over so many hours. For example, the Autopilot uses 1.5 amps and I plan to run it for 24 hours when we are on passage. So it uses 36 amp-hours in my table. Note you must stick with the same voltage when you do this – so I am using 12V – but the same calculation can be done at 24Volt as well. If you only have a wattage rating on the device – such as a 60 watt bulb – divide by the voltage to find the amps uses – 60/12=5 amps. To do my table I used the internet and was able to find specs on a number of the gadgets I intend to put on the new boat. For instance, the cappuccino maker (;-) uses 1400 watts so I calculated 1400/12 is 118 amps at 12 volts. Not really accurate since the inverter will use some as well but this is meant as a rough calculation – after all, the number of hours we will use is a bit of a guess anyway. Calculating the number of hours a gadget will be used is a fun activity on a winter day! You can visualize the situation and put yourself on the boat. How long would you play (I mean work) on the computer every day? If you are doing this calculation for a boat you already own you can make notes from past excursions. And hopefully you have an ammeter so you know how much the gadgets use as well. (If not its definitely worth getting one! An ammeter is a great tool to help manage your electrical system). Assume windlass is used only when the engine is running so it is not included - budget is only for calculations of battery capacity. - Radar is in transmit mode for 3 hours. This is a assuming a bad night because we normally leave it in standby mode. Of course in fog it would be on 24 hours. - Refrigeration is always a big user. I hope this will be efficient but it may be on more than I budget, and may be on more when its really hot. - Cabin lights don't use much. I am assuming a few reading lights and thats it. If you like it brighter be prepared to have lighting as one of the largest users of power. - Autopilot use is for moderate sea conditions. In my experience they can use very little if the sea is light or the boat balances well. The Southerly has a very light helm so I predict it will be a low power user in "auto" mode. 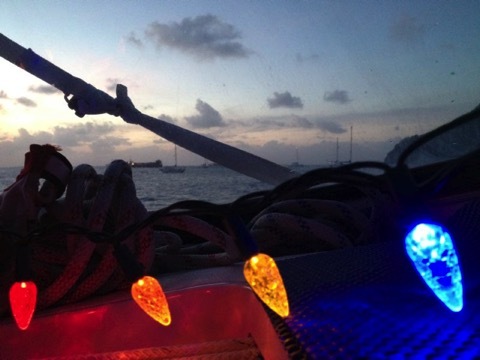 - cabin lights are entered twice since we use them differently at sea and at anchor. At sea we just have 2 small lights on for watch the whole night. At anchor we have more but plan it for a typical sailors early night! If you are planning a budget like this, you might want to splash out on lights, a big deep freeze and other things, but whatever you plan, your batteries should be able to supply the needs without needing a charge more than once a day. I am assuming I will want to recharge once a day, and that I shouldn't use more than 50% of the capacity of my batteries. So I am planning a bank somewhat larger than 400AH. Basically double the "Daily AH on Passage" total of 198 amp-hours). That's it for now. Got to run and pack! !